Aroview: Madeleine Sami and Jackie Van Beek write, direct and star in this frisky and flat-out hilarious Kiwi comedy as heart-burned pals who form a small-time business that breaks up couples for cash. 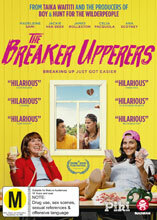 Full of inventive and subtle subversions of rom-com conventions, the genuine comic chemistry of the leads extends to the superb work of supporting sisters Rima Te Wiata, Karen O'Leary, Ana Scotney and Aussie Celia Pacquola, while token bro James Rolleston grins himself silly as an adorable 'himbo'. Big ups to all youz guyz!